The Astronomer has a mad crush on Noodlepie and I can’t say I blame him. Whenever I ask The Astronomer where we should eat for lunch, he always visits Graham’s blog to locate a tasty option. 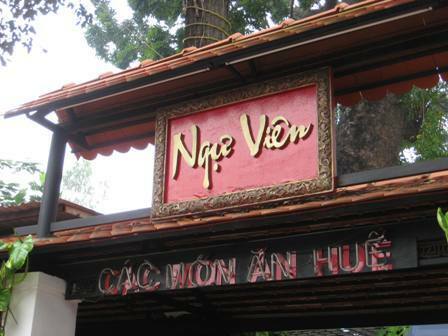 The other week he chose Ngu Vien on Ky Dong Street because Noodlepie proclaimed it as the “best all around” restaurant in Saigon. Prices have jumped dramatically since Pieman’s days, but the food is still superb, especially the Ca Hu Kho. 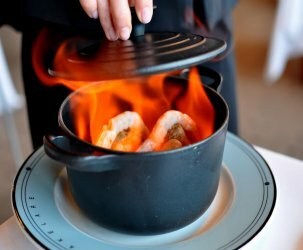 The flaky braised fish was served piping hot inside a clay pot. I filled my little bowl with a bit of white rice, a nice hunk of de-boned fish (skin and all) and topped it off with some syrupy caramel sauce. One bite, and I totally swooned. 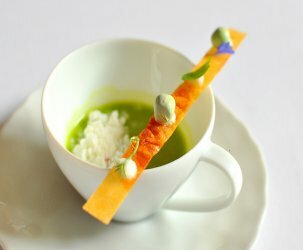 I haven’t been this moved by a dish since the Wagyu at Alinea this past June. The flavors were damn near perfect and I cannot imagine straying from this dish when I return to Ngu Vien. The Astronomer chose the Bo Tai Dua and Com Sen. 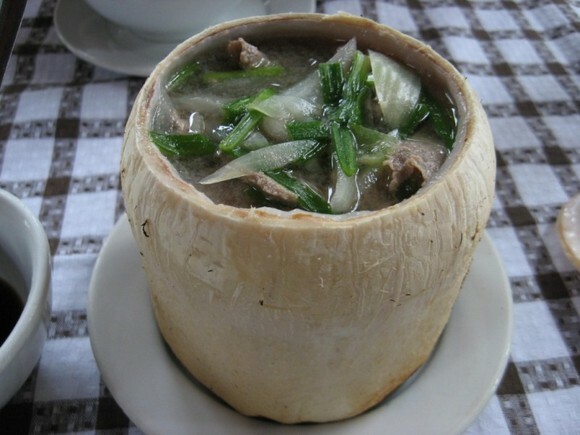 The Bo Tai Dua consisted of thin slices of beef, scallions and onions cooked inside a young coconut. The flavors were subtle and not coconut-y. The beef was plentiful, but not as tender as I had hoped. 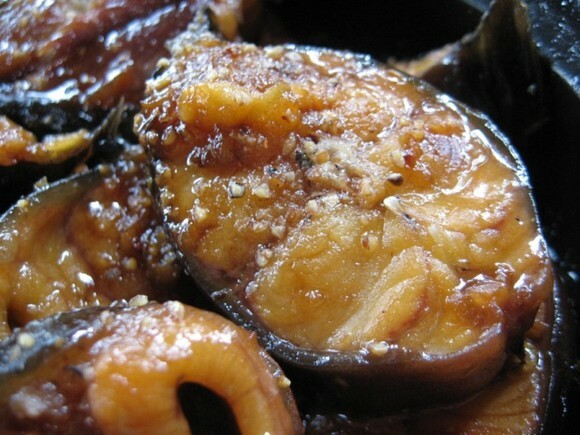 Compared to the insanely flavorful ca kho, this dish just wasn’t striking. Even though I personally wasn’t into the coconut beef, The Astronomer liked it very much because he appreciates milder flavors. On the flip side, the Com Sen was subtle in a pleasant way. The dish looked like a delicate package upon arrival and we tried our best to keep the leaf intact as we ate. 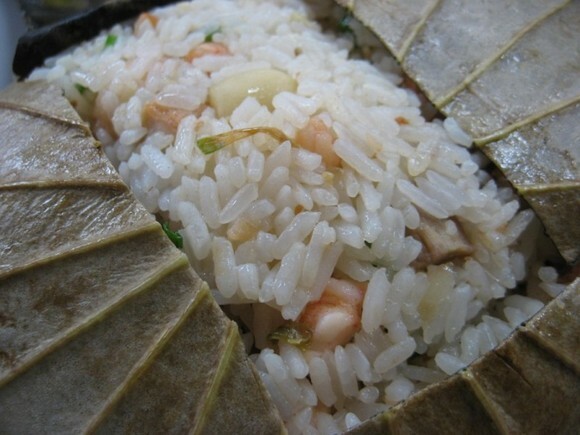 The rice was filled with lotus seeds, bits of pork and shrimp and a smattering of scallions and steamed inside a fragrant large lotus leaf. The rice was wonderful alone or paired with the beef and fish. 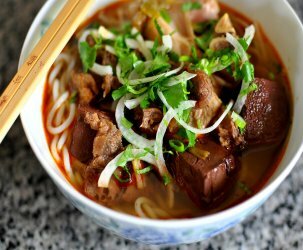 Even though Ngu Vien specializes in foods from Hue, they do a fine job executing a variety of other Vietnamese favorites as well. Thanks for you kind words. Not only has Ngu Vien risen the prices, it looks as though they’ve invested in a new sign 🙂 I always found the servers here to be most helpful and extremely polite. I used to pop in here pretty much once per week for a take home jobbie. I can’t think of anything on the menu that I ever disliked. When I look back now, it’s kinda funny that this is literally the first resto noodlegirl and me dropped into when we first moved to Saigon. It was also one of the last. 4 or 5 years. Arrhhh… feeling a bit Saigon homesick. We forgot to note the address and ended up at Ngu Vien at 45C Ky Dong. According to another web site it has moved so it is apparently the same place. The Ca Kho To (Hu) was quite good, although less carmelly than most preparations (and than the picture on this blog). So more subtle, but delicious (the fish was very fresh). We also had an excellent rice porridge with eel. Hi Cathy, could we order Com Sen without pork in it, could you assist me how to say it 🙂 . I’m part of foodies group from Indonesia that plan to visit Saigon in Oct 7-10 , we plan to eat in several places there. It’s me 2nd visit to Saigon, hopefuly you and astronomer could join us in some point.